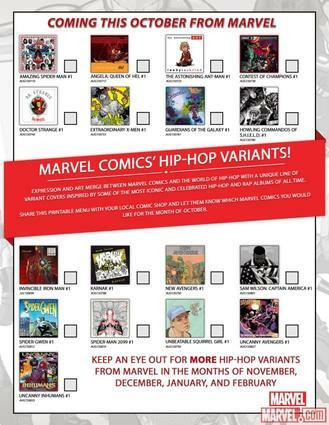 Here's your checklist for all of Marvel's hip-hop variants, available throughout fall 2015! Stay tuned for updates! Expression and art form merge between Marvel Comics and the world of hip-hop with a unique line of hip-hop variant covers inspired by some of the most iconic and well received hip-hop and rap albums of all time. Available starting in October, and available throughout the fall and into the winter, these more than 50 variant covers pay tribute to iconic albums beloved by comics fans and creators. Check out the Marvel hip-hop variants on sale in October. variant availability will differ from retailer to retailer. Be sure to ask your local comic shop for the variants you want! And see what some of hip-hop’s legendary artists are saying about this extraordinary collection!